My father had a regular routine on the weekends, about monthly, of polishing his shoes. Perhaps since I’m a process-loving person, I enjoyed watching this routine. It started with setting up a space for several pairs of shoes to sit – whether on the floor in front of him while he sat in his favorite chair, or on an ottoman in front of him. Next, he pulled out the appropriate colors of shoe polish – usually black, cordovan and maybe dark brown. Next came the polishing cloth and brush as well as a soft rag. Dad always began the process by dusting the residue off each of the shoes with his soft rag, prepping them as the shoe polish directions state – “Apply to clean shoes.” Next, he would dip his polishing cloth into the appropriate polish color, swirl the color onto the shoe from heel through toe, side to side, carefully applying along the edges, through the tassles or among the shoe lace holes. 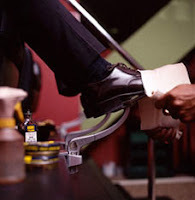 Carefully inspecting his work for thorough coverage, he would then set down each shoe with applied cream onto a paper towel, aware that the shoe polish would rub onto the ottomon or floor if not protected. Since the “setting” process takes several minutes, his attention to many shoes at once usually allowed him to make good use of his time. Once he had polished 2 sets of shoes, the first was now ready for buffing. Whether his shoes were patterned or smooth was the deciding factor on using a brush or a rag for the buffing. Although he could buy a rotating buffing brush, Dad preferred the manual approach of “elbow grease” to do justice to the polishing effect. There’s much more pleasure through the process when applying our own pressure than relying on the mechanisms of a tool. Today I help individuals polish their act, whether when handling tough conversations, when business building through networking, or when speaking in public. Many of the same techniques we apply that my father taught me through his shoe-polishing process. 1. Start with a clean surface. In the case of speaking well or having confidence in yourself, this means begin with an open attitude. An open attitude accepts feedback and allows it to stick. 2. Apply the soft rag to remove the dirt – don’t be too hard on yourself when you see problems. Simply rub out the flaws and move on. 3. Choose the appropriate tone for the impact you want. Address the circumstances with humility, curiosity and enthusiasm. Whichever makes sense. 4. Uncover the barrier patterns that stand in your way. If you need to remove some rough edges, dig deep to do what is necessary. Get real about them. Then break them down. Like dirt on shoes that makes the polish mar the effect,these patterns will continue to hold you back until you break them down. 5. Allow the polishing process to take time to really set well. Plan what to focus on, prepare the steps, and then practice. When you create polish, not only your shoes shine, your spirit does. You have a slight dance in your step as your soul connects to a more purposeful way of being. When you are polished, you definitely put “your best foot forward”.